The World Health Organization (WHO) has established a classification of pesticides by hazard based on their estimated acute toxicity for humans. Since pesticides are not directly tested in humans, the classification is based on toxicity studies done on laboratory animals, mostly rodents, but also other mammals. The most used toxicity measure is the so-called acute LD50 in rats either oral or dermal. LD stands for "Lethal Dose", and "50" means "for 50% of the treated animals". An acute oral LD50 of 55 mg/kg on rats means roughly that 55 mg/kg is the dose (single oral administration) at which 50% of the treated rats died. Other similar tests determine the LD95 (meaning the lethal dose to kill 95% of the treated animals) or the LD100, (meaning the lethal dose to kill 100% of the treated animals), etc. To get a feeling on what this means: if the human LD50 of a compound is 5 mg/kg, 0.5 g would be enough to kill an 80 kg adult person (0.4 g = 400 mg = 80 kg x 5 mg/kg), i.e. 1 kg of that compound would be enough to kill 2'500 persons (= 1000 g / 0.4 g/person). There are other hazard classifications of pesticides, e.g. from the US EPA (Environmental Protection Agency) or from the EU. They are not substantially different. The WHO classification is the one adopted by most countries worldwide. 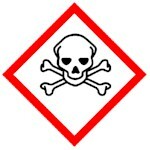 In most hazard classifications for pesticides there is no class determined for something like "harmless". This makes sense considering that all pesticides "kill something", at least pests. Nevertheless, it is good to know that many pesticides are not more toxic than e.g. common salt or alcoholic beverages. The lethal single dose of common salt for humans is 3'000 mg/kg. This means that for an an 80 kg adult person the lethal dose of common salt is close to 240 g (=3000 mg/kg x 80 kg). The lethal single dose of pure alcohol is 2'000 to 4'000 mg/kg. This means that 160 to 320 g alcohol (about the alcohol content in 1 liter whisky...) can be lethal for an 80 kg adult person. Pesticides with an LD50 (in rats) between 2'000 and 5'000 mg/kg must be labeled as "moderately hazardous". Neither common salt nor whisky must be labeled as "moderately hazardous". The WHO and other classifications are based on acute poisoning hazard after single exposure, usually accidental. They give no indication on the risk of health risks after chronic exposure to sub-lethal doses, i.e. the risk of becoming sick after repeated exposure to low doses that bear no risk of acute poisoning. Whether a parasiticide (or any other chemical) is hazardous or not has nothing to do with its smell, color or taste. However, a change in the product appearance (e.g. in its color, smell, etc.) when compared with fresh product often indicates that it is spoiled: it must be disposed of following the label instructions. It is important to know that spoiled parasiticides can be substantially more toxic than the original products (especially products some organophosphates and carbamates). "Technical grade" vs. "pharmaceutical grade"
The WHO hazard classification refers to technical grade active ingredients used in pesticides. In this context "grade" has to do with impurities. No chemical substance is 100% pure. It contains by-products that are produced during manufacturing, and impurities carried over from the raw materials used for manufacturing. Eliminating such impurities is very expensive. And depending on the use of an active ingredient, the highest purity is not always required. Unfortunately, many countries have their own classifications and definitions regarding chemical grades, which is often confusing. Technical grade. Usually means a purity of ≥95%, i.e. they contain ≤5% impurities. In many countries this grade is acceptable for crop pesticides or other industrial uses, but not for use on human or veterinary medicines. Pharmaceutical grade. Usually means a purity of ≥98%, i.e. they contain ≤2% impurities. In the US this is the so-called U.S.P. grade (from United States Pharmacopeia) required for all active ingredients to be used in human and veterinary medicines. Other frequently used grades are analytical grade (often the purest grade, ≥99.9%), food grade, cosmetic grade, laboratory grade, etc. In the context of safety, the amount of impurities is quite relevant, because impurities can be toxic as well, even more toxic the active ingredient. If an impurity is 100 times more toxic than the active ingredient, than the quality of the active ingredient is essential for it's safety, because 1 mg of impurity is as toxic as 100 mg of the active ingredient. In fact, there are parasiticidal active ingredients that became significantly less toxic (i.e. got a higher LD50) after modifications of the manufacturing process that eliminated some very toxic impurities. Which grade is required for manufacturing veterinary products depends on country-specific regulations. In some countries pharmaceutical grade is required for all veterinary products; in other countries technical grade is acceptable for topical parasiticides (sprays, dips, etc). These differences can have a significant impact on product quality and safety of veterinary products in different countries. An active ingredient in a pharmaceutical or veterinary medicine is the chemical compound or substance that is biologically active. In a parasiticide the active ingredient is the substance that kills the parasites. The active ingredient is also called "active substance" or "active compound". Besides the biologically active ingredient all veterinary parasiticides contain other biologically inactive or inert ingredients, also called excipients. Altogether the active ingredients and the inert ingredients build the formulation. Each veterinary (or human) medicine or parasiticide has its own formulation, i.e. its own recipe or composition. Within a formulation the inert ingredients can make anything between 99.9% and 20% of its composition. There are a few hundred active and inert ingredients used in veterinary parasiticides. For most of them a standard package of toxicity studies (LD50s) has been performed that allows to classify them by hazard. But there are thousands of formulations worldwide. The WHO recommends determining the acute oral and dermal LD50 on rats for every formulation running the corresponding laboratory studies. In many countries this is routinely required for registration of any veterinary drug. Unfortunately, in many other countries this is not required and is not done. For these cases, the WHO recommends using the following formula for roughly estimating the LD50 of formulations: (LD50 of the active ingredient) x 100 / % of the active ingredient in the formulation. This is a very inaccurate value, but is better than nothing. If the formulation contains more than one active ingredient or other toxicologically relevant ingredients, they must be considered. Pesticide means pest-killer and is the term commonly used for chemicals that kill pests of crops, e.g. insects, mites, etc. Most veterinary external parasites are also insects, mites, etc, and the products used against such veterinary ectoparasites contain the same active ingredients as those used against crop pests, i.e. pesticides. Consequently for many years veterinary ectoparasiticides were also considered as pesticides. In contrast with this, the term medicine (or drug) stands for chemicals used to cure diseases, primarily in humans, but also in animals. Regarding veterinary parasiticides: Are they pesticides? Are they veterinary medicines? There is abundant room for confusion, for several reasons. One reason for confusion is that some infections with external parasites are considered as a disease, instead of (or in addition to) a pest. An animal suffering from lice infestation has "pediculosis"; an animal suffering from mite infestation has "acarosis", cattle with grubs have "hypodermosis", etc. Parasiticides used against lice, mites or grubs, are they pesticides or veterinary medicines? There is usually no confusion with endoparasiticides (mainly anthelmintics) used against parasitic worms, because most worms that infect animals do not infect crops, and the active ingredients used against veterinary helminths are mostly not the same as those used against crop helminths. Another reason for confusion is that along the years, crop pesticides have got a very negative image in the public opinion. Manufacturers of crop pesticides cannot get around the fact that they are selling pesticides. But manufacturers of products against external parasites (e.g fleas, flies, ticks, etc.) don't want to be perceived as selling poisonous pesticides. Therefore they will never talk about pesticides, but about veterinary medicines (perhaps about ectoparasiticides) unless forced by national regulations. Since national regulations on this topic are often different, the same product from the same manufacturer may be a pesticide in some countries and a veterinary medicine in other countries. A third reason for confusion is that there are active ingredients that are used in animals against both external parasites (ticks, mites, lice, etc.) and against internal parasites (roundworms, tapeworms, etc.). Are they pesticides? Are they veterinary medicines? Are they both? A typical case is ivermectin, which is used as a pesticide in crop protection, as a human medicine against several human parasites, and as a veterinary medicine against both external and internal parasites. Is ivermectin a pesticide? if you ask manufacturers of crop pesticides they cannot say no. If you ask manufacturers of veterinary or human medicines they don't want to say yes. If you ask environmentalists they will definitely say yes. If you ask me, I will say yes and no. Does it matter? In the context of hazard classifications, the consequence is that the active active ingredients in some veterinary parasiticides can be clearly considered as pesticides (e.g. amitraz, organophosphates, synthetic pyrethroids, fipronil, imidacloprid, etc. ), are included in hazard classifications, and manufacturers must include the corresponding warnings in the product labels. In contrast with this, other active ingredients are not considered as pesticides but as veterinary medicines, are ignored in hazard classifications (e.g. most benzimidazoles, levamisole, praziquantel, pyrantel, most macrocyclic lactones, etc.) and get no hazard warning in the label, even if some of them are significantly more toxic than many pesticides. A Material Safety Data Sheet (MSDS) is a document with essential information on the potential hazards (poisoning, explosion, etc. ), precautions when handling it during manufacturing, transport and storage, first aid, etc. Such MSDS are also issued for veterinary parasiticides, but they are used only for transport and storage of industrial quantities, not for reselling to end users. MSDSs of veterinary parasiticides do not include safety instructions for the use on domestic animals. These safety instructions are usually part of the product label and must be approved by the national veterinary authorities.